In a cost-cutting move today the Government has commenced the first of its new 'two for the price of one' policies. 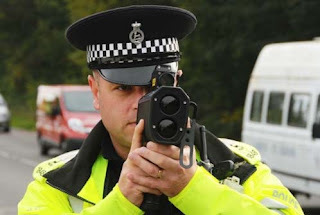 Noting the overwhelming number of canine passengers in cars caught on speed cameras, it was felt more cost-effective to chip all UK-resident dogs with an accelerometer and GPS then have roadside sensors beam the owners address and vehicle velocity to a new £5 million pound central database in the event of some road-traffic breach. After successful trials with computed axial tomography (CAT scan) systems, housed in supermarket aisles to gauge public reactions to a 'beeping bloody machine' , Jeremy Clarke ( MP for Chipping Norton, South Gloucs) concluded "Well Tescos do it . . . tell us something is 'price crashed' and we consequently adore them for charging us £1 for a 20p tin of pet food, why not the spirit of entrepreneurialism in our policies?" Adding "You never know someone might decide our NI number cards could be like . . . ow - I dunno, a sort of ID card? Ya know? Later with driving-licence and CRB detail all scanned in? Blimmey! THREE for the price one! Just like Asda?"